Along the shores of Lake Mendota in Madison, Wis., stands a towering pine tree nearly 100 years old. Its owner, Walter Meanwell, Jr., lives in the tasteful lakeside home his father had built in the 1920s. The tree is known as the Rockne Pine, owing to the great friendship between Walter “Doc” Meanwell and Knute Rockne, legendary coaches of Wisconsin basketball and Notre Dame football, respectively. Coach Knute Rockne with Doc Meanwell in the 1920s. When Notre Dame and Wisconsin square off in the East Regional on Friday in Philadelphia, it will be just their second basketball meeting in the past 47 years. On the gridiron, the Irish and Badgers haven’t met since 1964, when Notre Dame players carried Coach Ara Parseghian off the field at Camp Randall after his first victory as their coach, a 31-7 triumph over the Badgers. But there was an earlier time when the two athletic programs were closely aligned. 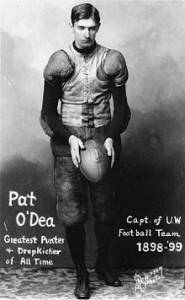 It started with Pat O’Dea, who came from Australia to become Wisconsin’s first great football star, in 1896-99. The two-time Badger captain was a national sensation, kicking field goals as long as 62 yards, along with a 116-yard punt. The “Kanagroo Kicker” was named an All-American in 1899, leading the Badgers to a 9-2 mark. The next fall, O’Dea was named the fifth head football coach of the Fighting Irish, and was able to schedule a game with the mighty Badgers, who pasted Notre Dame, 54-0. O’Dea left South Bend after two seasons as coach, but Notre Dame and Wisconsin met again in 1904 and 1905. After Notre Dame defeated Michigan in 1909, Fielding Yost influenced his Western Conference brethren not to schedule the Irish, a boycott that lasted nearly a decade until 1917, when Wisconsin ignored Yost and played Notre Dame to a scoreless tie. 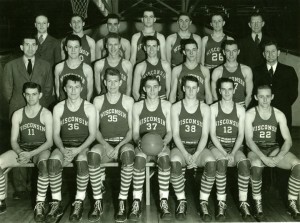 By this time, Doc Meanwell had established Wisconsin into one of the most accomplished basketball programs in the nation. 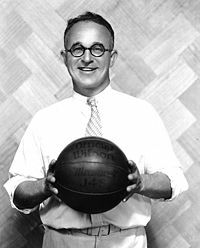 Beginning in 1911-12, he guided the Badgers to four Western Conference championships in five seasons. His squads of 1911-12 (15-0), 1913-14 (15-0) and 1915-16 (20-1) would later be named national champions by the Helms Athletic Foundation. An admirer of Meanwell and his success was the young track and field coach at Notre Dame, Knute Rockne. On several occasions, Rockne brought his Irish track squad to Madison for track meets, and marveled at the “fine strapping lads” he saw competing for UW. Also the assistant football coach, Rockne would size up track stars for their potential on the gridiron. After Rockne took over for Jesse Harper as head football coach in 1918, he continued to coach track, and kept in touch with Meanwell, making more visits to Madison. On one such track trip, Rockne had to assign someone to keep an eye on sprinter (and football standout) Elmer Layden. It seems one of Layden’s hometown sweethearts from Davenport, Iowa, had matriculated to Wisconsin, and Rockne wanted to make sure Layden didn’t get any ideas about transferring to re-connect with her. Rockne and Meanwell also combined to publish the first authoritative guidebook on athletic training, injury prevention, and treatment. Their names were synonymous with success on the field and court, and proper treatment of their student-athletes. From one of their summer coaching schools, Doc Meanwell took a pine sapling as a souvenir, and planted it beside his home, where it became known as the Rockne Pine. It took a few years, but Meanwell and Rockne were finally able to get their schools to schedule each other in basketball. The Irish made a return trip to the Red Gym the following season, on Feb. 7, 1928, winning again by a football-like score of 21-14. Three years later, Rockne was gone, having perished in the plane crash that claimed eight lives in eastern Kansas on March 31, 1931. In 1934, Meanwell retired from coaching, with a record of 246-99 in 19 seasons of coaching the Badgers, including eight first-place conference finishes. Soon thereafter, two of Rockne’s Four Horsemen brought Notre Dame and Wisconsin back together again. Harry Stuhldreher, quarterback of the Four Horsemen, was like so many of Rockne’s athletes in that his success at Notre Dame, and Rockne’s reputation and connections, led him into coaching after graduation in 1925. He become Villanova’s head coach right out of Notre Dame, and coached the Wildcats the next 11 seasons. In 1936, Stuhldreher became head football coach and athletic director at Wisconsin, and by the next winter, he and his counterpart at Notre Dame, fellow Horsemen Layden, arranged to have the Badgers and Irish again meet on the hardcourt. Coach Keogan was still at the helm for the Irish, having won another Helms championship in 1936. On Dec. 13, 1937, at the Notre Dame Fieldhouse, an Irish team captained by another future Hall of Famer, Ray Meyer, edged the Badgers and their fourth-year head coach, Harold “Bud” Foster, 33-31. That started a near-annual series that became a December tradition, and continued beyond Stuhldreher’s tenure at Wisconsin. He retired in 1950, and the teams continued playing through 1959. The 21 games played from 1937-59 included 13 Notre Dame victories, and eight for Wisconsin. Among the Badger victories was a 44-43 nailbiter on Dec. 14, 1940 at the UW Fieldhouse. Wisconsin, under Foster, would go on from there to a 20-3 record and the NCAA championship, in just the third season the NCAA tournament was held. 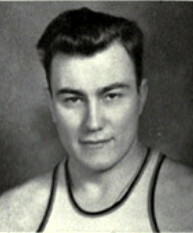 A key figure in keeping the series going was Edward “Moose” Krause, who had starred on Notre Dame’s basketball teams of 1931-34. Krause coached the Irish basketball team in 1943-44 and 1946 through 1951. He became athletic director in 1949, serving until 1981. Another four ND-UW basketball meetings occurred in the mid to late 1960s, including Notre Dame’s first victory at the newly-opened Athletic and Convocation Center, 57-56, on Dec. 11, 1968. Four days earlier, the ACC was dedicated with a game against No. 1 and defending national champion UCLA. John Wooden, who started his coaching career at South Bend Central High School, led his Bruins to an 88-75 victory over John Dee’s Irish. The teams have met only once since that game – a 58-51 Irish victory in the 2010 Old Spice Classic in Orlando. Notre Dame holds an overall mark of 18-10 in 28 games vs. the Badgers. This is their first meeting in the NCAA tournament. Somewhere, Rockne, Doc Meanwell, Horsemen Stuhldreher and Layden, George Keogan, Bud Foster and others have to be smiling. Notre Dame football historian Jim Lefebvre is author of the award-winning books Loyal Sons: The Story of The Four Horsemen (2008, Great Day Press) and Coach For A Nation: The Life and Times of Knute Rockne (2013, Great Day Press). A native of Green Bay, Wisconsin, Jim studied journalism at the University of Wisconsin-Madison and covered UW athletics for newspapers in Madison and Milwaukee.